Rhys James is an accomplished comedian, writer and actor. Rhys James is a comedian who began performing in 2009 in student competitions such as Comedy Central’s Funniest Student in 2010, and Chortle’s Student Comedy Award. He made his Edinburgh debut as a performer for The Pleasance Comedy Reserve in 2010, and again in 2012 as a performer in AAA- Stand Up. 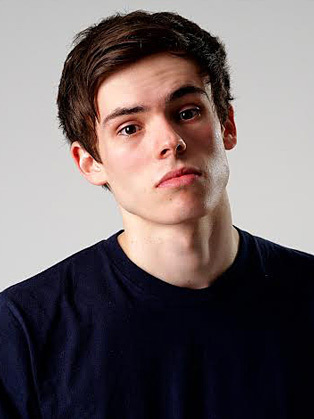 In his twenties, Rhys James has already made numerous TV appearances, on shows such as Mock The Week (BBC2), Russell Howard’s Stand Up Central (Comedy Central), Virtually Famous (E4), Sweat the Small Stuff (BBC3), @elevenish (ITV2) and many more. He has performed three solo shows at the Edinburgh fringe to complete sell-out audiences and critical acclaim, earning his 2017 show ‘Forgives’ a spot in the British Comedy Guide’s ‘Best Reviewed Shows of the Fringe’ list. His own Radio 4 series, ‘Rhys James is…’ debuted in 2016. He is also known for his prolific Twitter feed which has been recommended in The Telegraph, The Sun, Huffington Post, The Poke and The Gentleman’s Journal among others. In 2018 Rhys James hosted the brand new radio series "Rhys James is... Priveliged" on BBC Radio 4. Rhys also hosts a weekly show on The Football Republic called "Top 10 Football F**k Ups" which garners a weekly audience of well over 150,000 viewers, as well as a weekly segment on BBC2's "The Premier League Show" called "Rhys's Pieces". A cut above his humdrum peers. Next up the rather dashing and precocious young talent Rhys James had some truly great jokes which will see him prosper in no time at all. At 22-years-old, Rhys James is a sickeningly talented young stand-up. He’s a super-sharp writer, with a ton of smart, intricately-written jokes and stories where you’re never more than a few seconds away from another punchline. A sharp and confident comedian. His day job as performance poet was evident from the fun he has with language. It’s that febrile mind that sets him apart.